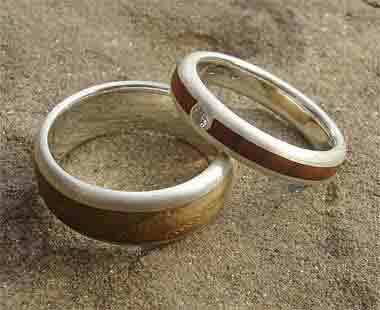 WOODEN ENGAGEMENT RINGS : LOVE2HAVE in the UK! The BEST! British wooden engagement rings with diamonds that sparkle. We are very proud of all our designers who produce the most exquisite and unique designs for all our customers. At Love2Have, buying a unique engagement ring is something we can help you out with, and in our opinion, there is nothing more unique or alternative than a wooden engagement ring set with a diamond or other precious stone. You will notice from the designs that the set stones are in the silver parts of the engagement rings rather than the wood because the wood is far too soft to work with and any diamond or precious stone would fall out very quickly. We want you to be happy with your purchase from us, so we have set the diamonds and gemstones into the silver which is far more secure. We often get asked about the care for the woods in these engagement rings. The wood isn't technically treated or protected in any way, but it is OK when worn in water (but not too often), and there are far fewer problems if worn every day. We find that the natural oils in our skin are good for the wood. If it dries out a bit, it can be oiled slightly with teak, linseed or olive oil. Not too much, just a little dab, or it can saturate the wood and make it fall out. Remember, even though we use hardwood in these wooden engagement rings, it is only wood, so will scuff against hard surfaces.